Hello everybody name's Razvan or for short Raz. 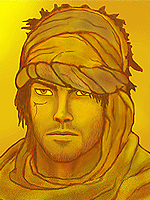 I'm from Romania Bucharest and of course I really love Prince of Persia. I know this game from my mom...yeah she's also a fan of POP. I'm so glad that I join this popfans. Welcome to the forums! I hope we´ll see you around a lot! Hi, [You must be registered and logged in to see this link.]! I hope to see you here a lot!. If you have any question, feel free to ask . ~The Sand Wraith~ wrote: Hi, [You must be registered and logged in to see this link. ]!